You’re finally pushing beyond your comfort zone and embracing social media to connect more with your customer base and to grow your business. Social media has forever changed the way businesses interact with their customers, so now is the time to jump in and start figuring out how hashtags for business work. Figuring out hashtags is a must if you want to use the various social channels to reach new customers. But don’t worry, they’re really not that complicated. Soon you’ll be hashtagging like a pro! In this article we’re going to briefly go over how to use hashtags, when to use hashtags, proper hashtag use and common mistakes to avoid when using hashtags for business. Hashtags are all those words and phrases – beginning with a pound sign (#) and containing no spaces or punctuation – that you see in social media posts. They’re used to describe the content in posts and to link together posts with similar content. Some are straightforward and descriptive, while others are goofy and quirky, but they’re a fun way to organize posts from various people and companies across an entire social media platform. And most importantly, hashtags are a fantastic way to help people who don’t follow you to find out about your products and services and hopefully become customers along the way. Basically, you just type up a post for Facebook or Twitter post or wherever, and you add in a little hashtag like this — #hashtagsforbusiness. It’s really that simple. Now, some hashtags are very popular and will have millions of people using them. Others will be more obscure, but that doesn’t make them less valuable. In fact, you should use both high-volume and low-volume hashtags for business in your posts. Keep in mind that popular hashtag streams move very quickly, so your post might only be seen for a few minutes or even a few seconds, but there’s a good chance that in that short timeframe your post will have been seen by hundreds or even thousands of people. So with such a short lifespan, hashtag marketing obviously has to be an ongoing process, something that you engage in frequently to maximize its potential. It’s a great opportunity to boost brand awareness, as long as you’re doing it right and not wasting time using irrelevant tags or jumping into streams where your brand doesn’t really fit. There are some best practices you should follow for proper hashtag use. 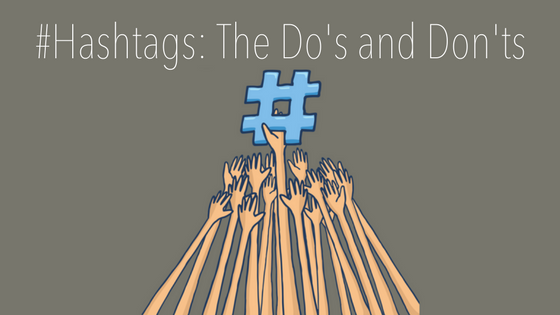 It might seem like common sense, but there are some things you should definitely not do with hashtags. First of all, don’t overuse them. Don’t be that marketer who crams 50 hashtags into every post. It makes you look desperate, ignorant and just plain spammy. Each platform is a little different, but a good rule of thumb is to use five or less tags on most posts, particularly Facebook and Twitter. You can get away with more tags on Instagram – up to 30 tags are allowed – but for the most part, less is more. Also, don’t us unrelated hashtags just because they might be trending. Keep it relevant. Another common mistake is the use of misspelled hashtags. Always double-check your spelling before making a post go live.